An instrument in writing may be canceled by cross-lines or by other marks obliterating it, or by burning or tearing the material on which the writing occurs. 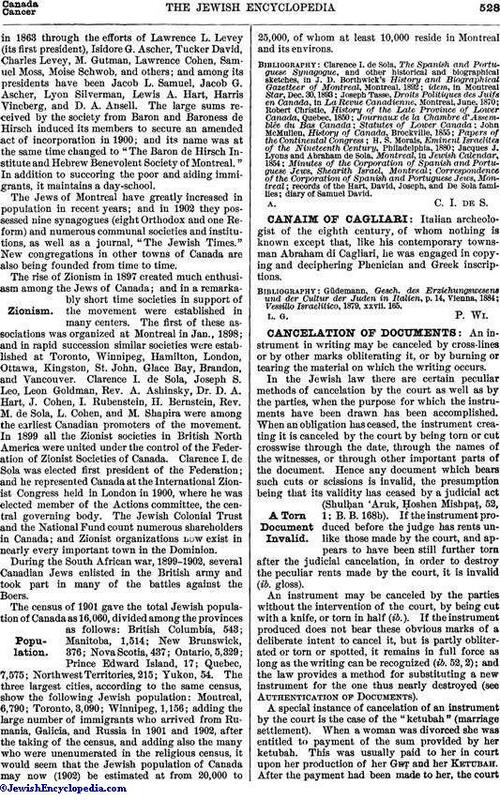 In the Jewish law there are certain peculiar methods of cancelation by the court as well as by the parties, when the purpose for which the instruments have been drawn has been accomplished. When an obligation has ceased, the instrument creating it is canceled by the court by being torn or cut crosswise through the date, through the names of the witnesses, or through other important parts of the document. Hence any document which bears such cuts or scissions is invalid, the presumption being that its validity has ceased by a judicial act (Shulḥan 'Aruk, Ḥoshen Mishpaṭ, 52, 1; B. B. 168b). If the instrument produced before the judge has rents unlike those made by the court, and appears to have been still further torn after the judicial cancelation, in order to destroy the peculiar rents made by the court, it is invalid (ib. gloss). An instrument may be canceled by the parties without the intervention of the court, by being cut with a knife, or torn in half (ib.). If the instrument produced does not bear these obvious marks of a deliberate intent to cancel it, but is partly obliterated or torn or spotted, it remains in full force as long as the writing can be recognized (ib. 52, 2); and the law provides a method for substituting a new instrument for the one thus nearly destroyed (see Authentication of Documents). 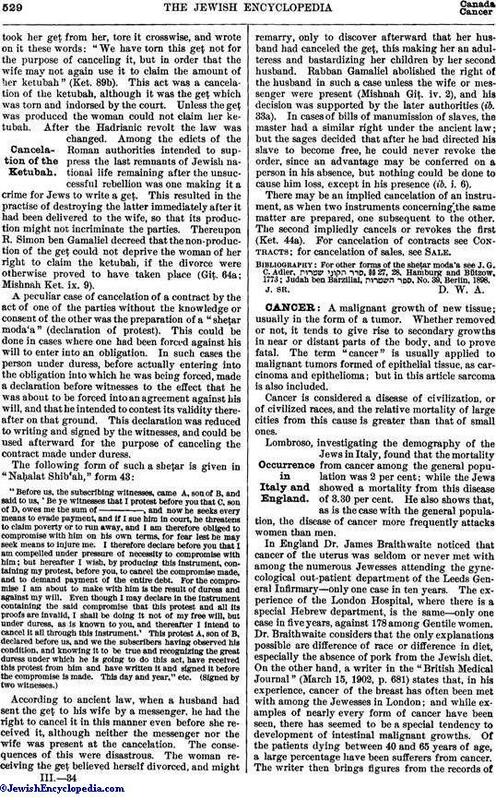 A special instance of cancelation of an instrument by the court is the case of the "ketubah" (marriage settlement). When a woman was divorced she was entitled to payment of the sum provided by her ketubah. This was usually paid to her in court upon her production of her Geṭ and her Ketubah. After the payment had been made to her, the courttook her geṭ from her, tore it crosswise, and wrote on it these words: "We have torn this geṭ not for the purpose of canceling it, but in order that the wife may not again use it to claim the amount of her ketubah" (Ket. 89b). This act was a cancelation of the ketubah, although it was the geṭ which was torn and indorsed by the court. Unless the geṭ was produced the woman could not claim her ketubah. After the Hadrianic revolt the law was changed. Among the edicts of the Roman authorities intended to suppress the last remnants of Jewish national life remaining after the unsuccessful rebellion was one making it a crime for Jews to write a geṭ. This resulted in the practise of destroying the latter immediately after it had been delivered to the wife, so that its production might not incriminate the parties. Thereupon R. Simon ben Gamaliel decreed that the non-production of the geṭ could not deprive the woman of her right to claim the ketubah, if the divorce were otherwise proved to have taken place (Giṭ. 64a; Mishnah Ket. ix. 9). A peculiar case of cancelation of a contract by the act of one of the parties without the knowledge or consent of the other was the preparation of a "sheṭar moda'a" (declaration of protest). This could be done in cases where one had been forced against his will to enter into an obligation. In such cases the person under duress, before actually entering into the obligation into which he was being forced, made a declaration before witnesses to the effect that he was about to be forced into an agreement against his will, and that he intended to contest its validity thereafter on that ground. This declaration was reduced to writing and signed by the witnesses, and could be used afterward for the purpose of canceling the contract made under duress. According to ancient law, when a husband had sent the geṭ to his wife by a messenger, he had the right to cancel it in this manner even before she received it, although neither the messenger nor the wife was present at the cancelation. The consequences of this were disastrous. The woman receiving the geṭ believed herself divorced, and might remarry, only to discover afterward that her husband had canceled the geṭ, this making her an adulteress and bastardizing her children by her second husband. Rabban Gamaliel abolished the right of the husband in such a case unless the wife or messenger were present (Mishnah Giṭ. iv. 2), and his decision was supported by the later authorities (ib. 33a). In cases of bills of manumission of slaves, the master had a similar right under the ancient law; but the sages decided that after he had directed his slave to become free, he could never revoke the order, since an advantage may be conferred on a person in his absence, but nothing could be done to cause him loss, except in his presence (ib. i. 6). There may be an implied cancelation of an instrument, as when two instruments concerning the same matter are prepared, one subsequent to the other. The second impliedly cancels or revokes the first (Ket. 44a). For cancelation of contracts see Contracts; for cancelation of sales, see Sale. Judah ben Barzillai, , No. 39, Berlin, 1898.